Sustainable increase of productivity is the result of numerous individual innovations and it is based on intensive experience and creativity of the development experts. A perfect example for this is the totally new designed axial rolling head EVOline from LMT fette. The proven benefits of the thread rolling process compared to cutting processes, like extremely short machining times at highest thread strength, constant dimensional accuracy and excellent surface qualities with high tool life, will be extended again and are setting a new standard in performance for thread rolling. Among the most significant features of the new axial rolling head EVOline is the easy to handle, but extremely precise fine adjustment into the diameter to be rolled and the easy assembly due to the modular design. The setting of the rolling diameter with fine adjustment in the range of 0.01 millimeter is featuring high replicability resp.repeatability of the pitch diameter and absolute process safety at highest handling comfort. The modular design of the rolling head contains of thread rolls, roller cage, rolling system housing incl, central fine adjustment, the closing clip reps,closing device and the shank with brand new adaption. All common shank sizes are available. 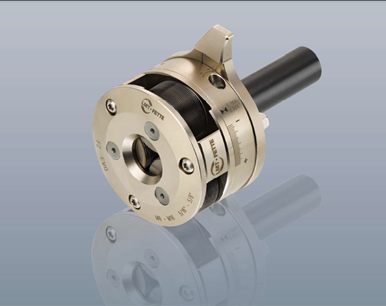 The interface between clutch and shank guarantees a precise concentricity combined with safe torque transmission. Customized modifications are possible. For example a coolant driven closing device can be integrated very easily as an option. EVOline – this is how rolling works today.